familiar with a CSA, it’s usually a farmer or cooperative of local farmers supported through the sale of “shares” of freshly harvested produce. For us, what it means is that every couple of weeks, a box of in-season goodies shows up at Vine HQ. The Sweet Partner in Crime and I have found that joining the CSA has really improved our eating habits, since we certainly don’t want these fresh-from-the-farm tasties going to waste! We look for recipes specifically to incorporate the items from the share, and those recipes trend healthy. The Fair Ridge Farms logo. Groovy, no? For the last little stretch, we’ve been swimming in lettuces. Our last couple of deliveries have contained three heads of delicious red leaf, romaine, and Boston lettuces, as well as some spinach, a few kinds of chard, kale – you get the idea. Plenty of roughage around these parts. What to do with all these greens? Well, make salads, of course – usually with as many of the other newly-arrived raw materials as possible! The bitterness of the greens, the various flavors of dressing, a myriad of ingredients – flavors are bouncing in all directions. The flavor of greens, with their associated bitterness, makes it nearly impossible to come up with a perfect wine pairing. Getting a “good enough” pairing is what you’re shooting for with salads. A salad wine pairing should be assertive enough to get its flavor across, but yet not kill the freshness. Acidity helps, but too much and you get lost in the flavor of the dressing most times. Best bet? I find new world Chardonnay to fill the bill. 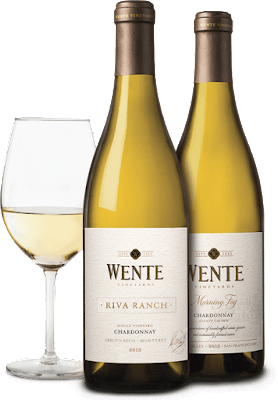 First up was the Wente 2013 Riva Ranch Chardonnay. The Riva Ranch started me with a gentle nose of apple blossoms, which is probably enhanced a bit by the small amount (3%) of Gewurztraminer blended therein. The first taste is quite fruity --a combination of sweet and tart apples along with a little melon. This is a fairly weighty chardonnay, but it managed not to be cloying in that weight. Big apple and butterscotch flavors on the palate, which heads off into a finish with a lasting bit of creaminess and a growing oakiness. All in all, it’s a fairly noble tasting white, which the Sweet Partner in Crime and I liked quite a bit. We had it alongside a grilled salmon-topped Caesar salad from our romaine. I would be hard pressed to hit a better pairing combination. The oakiness and residual acid cut nicely through the salmon’s oil, and the oakiness went nicely with the grilled flavors. Made for a really nice dinner. Retails for $22. A couple of nights later, we had the unoaked Wente 2014 “Eric’s Chardonnay” – which is named for Eric “Big Daddy” Wente. In my experience, much unoaked chardonnay runs toward the lighter side, packs lots of acidity, and offers a lot of crisp tartness. Big Daddy’s wine is a bit of a departure. The nose brings up peaches and pears instead. The first taste is very rich, almost glyceriney in texture, with quite a bit of heft. Tropical fruits – papaya and pineapple – are the main flavors. The finish, after a few sips, gains some richness and a little bit of that tropical fruit again at the back end. I think it’s definitely a chardonnay that calls for food. Dinner this time was a citrus-avocado red leaf lettuce salad with a yummy maple syrup vinaigrette, made with some syrup from a CSA winter share. I made a batch of my twist on Burneko’s Frickin’ Crab Cakes to go alongside or, more accurately, atop the greens. The combination of flavors in the salad was otherworldly splendid and the wine did what I wanted it to – be a good team player. The wine’s richness played nicely off the crab, and it had enough oomph not to get buttered over by some of that good fat of the avocado. I liked it, but I thought the price was a little on the high side at $25. 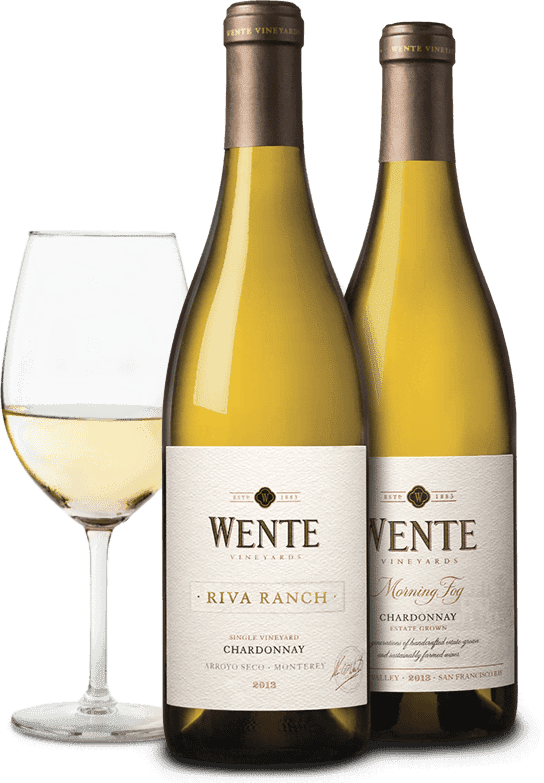 Finally, we tried the Wente 2013 “Morning Fog” Chardonnay – I expected a middle of the road California chardonnay here,as this was the least expensive at $15, and I pleasantly discovered something more interesting. The nose and first sips are Viognier-ish from the touch of Gewurztraminer (2%). The nose is almost perfumey with apple blossoms and the body has that spare-yet-rich palate that I find in many Viognier. Once the wine opens a bit, it turns into a straight-ahead, very decent California chardonnay. There’s a nice little oaky backbone, plenty of apple and butterscotch flavor, and an agreeable, lingering finish. We had this with a salad that had a lot going on. More fresh leaf lettuce, boiled egg, slow cooked salmon with thyme, capers, onion, and a maple syrup vinaigrette. Despite all those different directions, this wine made a solid accompaniment. I wouldn’t say it blew me away, but with that range of flavors, staying in the “pleasant” zone is an accomplishment. Good value here. Terroir comes up quite a bit around here, obviously. To refresh your memory, terroir is the combination of soil geology and composition, geographic location, and weather patterns that affect the growth of grapevines and thus affect the flavor of a wine. A wine made from Chardonnay in the cool, limestone-soiled French region of Chablis will taste completely different from a Chardonnay from the warmer, loamier soils of California’s Central Valley, for instance. The practical upshot of the effect of terroir is that, given enough consumption, you can make general assumptions of what a wine from a certain country or region will taste like. This is especially true in some of the regions lesser known by the general wine-drinking public. For instance, if I’m in a restaurant and I see a New Zealand sauvignon blanc on the wine list that I’ve not heard of, I usually feel fairly certain that the wine will be highly acidic and have grapefruity flavors with the occasional fragrance of fresh-cut grass. Of course, you’re familiar with the old saw about the word “assume” – and that can come into play with wine. One reason we can make these assumptions about a country’s wine flavors is that there tend to be areas of that region that dominate wine production – whether because of weather, amount of grape production, access to easy shipping, and any number of other factors. The New Zealand sauvignon blanc I mentioned above? I can also make an assumption that the wine came from the Malborough region of New Zealand, which leads that country in wine exports. However, other regions of the same country do their own twists on wine production – yielding wines that can be very different and certainly worth exploring. I received a pair of bottles from Juliana at Colangelo from a couple of Southern Hemispheric regions which are starting to make more of a dent in the U.S. wine market. Both turned out to be somewhat different than my usual expectations. The first bottle was from – surprise, surprise – New Zealand. As I’ve mentioned, most of the best known wines from there hail from Marlborough, which is on New Zealand’s South Island. This wine, the Trinity Hill 2013 “The Trinity” Red Blend, comes from Hawke’s Bay on the North Island. 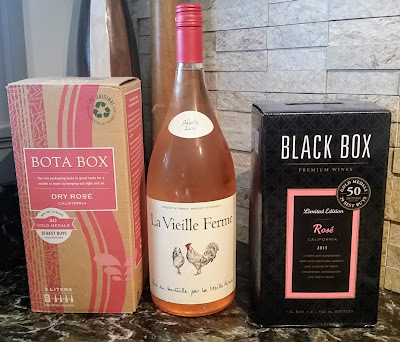 (I’ve actually written about a wine from Hawke’s Bay a couple of New Years Eves ago…) The reds I’ve tried from New Zealand tend to be on the lighter side, like pinot noir. The North Island’s climate is somewhat warmer, which allows for the growth of grapes that thrive in a little more heat. This Merlot-dominant blend with additions of Tempranillo and Malbec, packs a little more oomph in its pleasant package. The nose is fairly fragrant, full of plums and blackberries, and those big flavors are echoed on the palate. It’s not too thick – certainly falling into the medium-weight category, with plenty of grippy tannins that aren’t overwhelming. The finish is lasting and full, with blackberry, mint, and lasting tannins. We cracked this over Memorial Day weekend, and I’d grilled up a London broil. The Sweet Partner in Crime made a wonderfully hashy side out of some leftover Israeli couscous, crystallized ginger, leek, and asparagus and we laid the strips of steak atop. Just a lovely meal, I gotta say. For $17, this wine stepped right up. The other bottle was a Chardonnay from South Africa. The most common wines from South Africa are from regions such as Constantia, Stellenbosch, and Paarl – all of which have terroir that includes a warm climate. This makes for big, rustic reds – many of which are made from Pinotage, a cross between Pinot Noir and Cinsault that grows well in hot weather. The white wines tend to be made from sauvignon blanc and chenin blanc – again, good warm weather grapes. However, there’s much more attention now being paid to a region of South Africa called Elgin. Elgin is located on a high-altitude plateau, which allows for the creation of “cool climate” wines, which tend to be lighter in body and higher in acidity. From Elgin comes the Lothian Vineyards 2013 Chardonnay – billed as a more “Burgundian” version. I’m not sure I’d quite go that far with that description, but the flavors are certainly different from any other South African white that I’ve tried. Most of those wines tend to make good summer sippers, but this one makes for a much richer, fuller quaff. The nose brought to mind “toasted pear,” if that makes any sense. For a cool climate wine, the body is richly styles and somewhat hefty on the palate for a white with full flavors of honey, apple, and butterscotch. There’s some oak hanging out, too, but much less than I thought there would be given the nose. The Lothian finishes creamily, with just a quick citrus bite and a long butterscotch ending. I wouldn’t exactly call it “elegant” – that makes it sound dainty, which it’s not. I’d probably go for calling it “classy” chardonnay. Good alongside any sort of fish with a little oil in it. We had this with some rainbow trout filets over wild rice, and we found it quite nice. The pricetag on this one is around $20. If you’re a fan of California chardonnay and would like something with a slightly different twist, it’s worth a try.